Meghan Yankowskas defines herself as a musician by her energy and upbeat attitude with any musical undertaking that comes her way. Currently, Meghan serves as clarinetist in the United States Air Force Band of Mid-America out of Scott Air Force Base, IL. 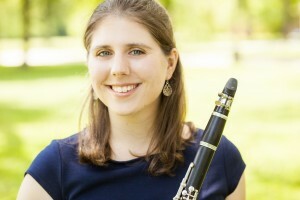 She has toured all around the Midwest with the Concert Band, Liberty Clarinet Quartet, and Freedom Winds Woodwind Quintet. Her solo endeavors have brought her music to local churches, art museums, and karate dojos. In 2011 and 2012, she was featured soloist with the Merrimack Valley Philharmonic Orchestra. Farley, IA (February 15th at Farley Elementary School); Dubuque, IA (February 16th at University of Dubuque Heritage); Epworth, IA (February 17th at Epworth Elementary School) and Waverly, IA (February 18th at Wartburg College).